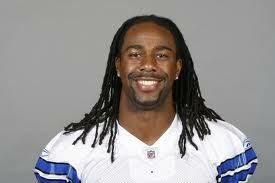 Remarkable Marketable Me: Dallas Cowboy's Jesse Holley ~ A Dream Come True and Making Dreams Come True! Dallas Cowboy's Jesse Holley ~ A Dream Come True and Making Dreams Come True! 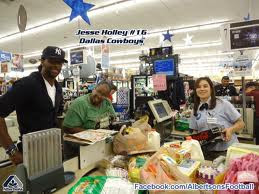 Go shopping with Jesse Holley from the Dallas Cowboys. Each week Albertson's is helping those that need a break every once in awhile. Family's will get up to $200 in groceries from Albertson's. Hi Jean Robb here. When I did “Monday Night in Texas” with Mr. Will, Coach Matt & the “DFW Sports Angel”…to talk about “Remarkable, Marketable Me" and the athletes giving back & around the NFLclick here to listen to the show http://www.kvceradio.com/2011/12/27/december-12-2011/ Robin talked about Dallas Cowboy's "Jesse Holley" and his gift of a $200.00 grocery shopping spree for a family in need each week. I really had to find out about this great athlete and his kind heart. Holley (6-3, 215) began his NFL career with the Cincinnati Bengals, who signed him as an undrafted free agent out of North Carolina in 2007. Holley spent five weeks on the Bengals’ practice squad that season, but was out of football in 2008. Holley was the winner of Michael Irvin’s 2009 reality show, which earned him an invite to the Cowboys’ 2009 training camp. Holley caught three passes for 19 yards and returned a punt 82 yards for a touchdown. 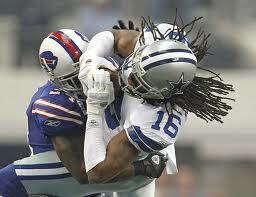 Waived at the end of camp, Holley spent all of last season on Dallas’ practice squad. In five pre-season games this summer, Holley caught 6 passes for 60 yards before being waived and re-signed to the practice squad in early September. 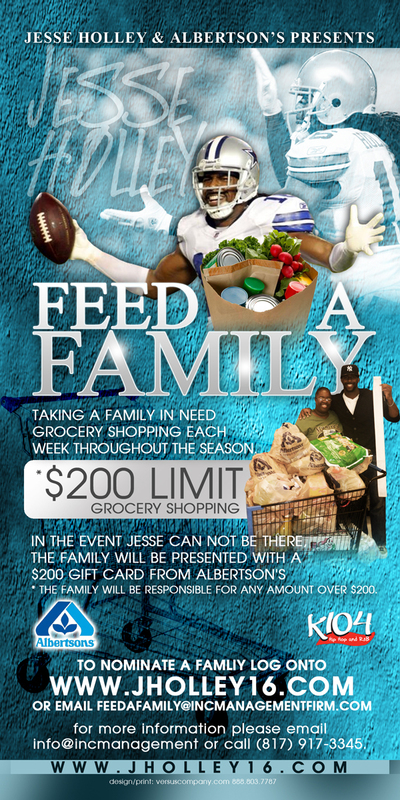 Jesse Holley has partnered with K104 morning team, he will be taking calls and will pick one deserving DALLAS family a week to take grocery shopping with a $200 limit throughout the football season. Please fill out the form below or email feedafamily@incmanagementfirm.com. Mr. Holley will personally evaluate and select the nominee with the greatest need. People don't choose to be hungry, which is why prosperous Texans shouldn't ignore others' suffering when the holiday season ends. It's honorable to volunteer at food banks or to write a check to provide food for the needy, but eventually Texans must come to grips with the reality that this state's dismal record on combating hunger is getting worse. "Texans should be shocked that a state as prosperous as Texas is doing so poorly, The food bank readily accepts contributions in food and money all year, but eradicating hunger also requires such comprehensive strategies as making sure the needy, especially those with children, receive food stamps and other assistance. that it will not continue ! Nearly one in five children in America can’t count on having enough to eat. Their bodies may not be rail thin, nor their bellies bloated like their counterparts in other countries, but they’re at risk of hunger all the same. They lack the energy to learn, grow and thrive. Download the 2011 Childhood Hunger Factsheet. More than 16 million children in America are at risk of hunger. That’s more than 1 in 5. Go To JHolley16.com and Nominate A family for "Feed a Family" this week!! !